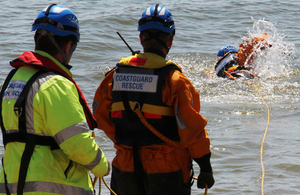 Liverpool Coastguard received a 999 call from a member of the public who had witnessed a young girl struggling in the River Mersey. Liverpool Coastguard radioed all local vessels and requested the New Brighton RNLI lifeboat and the Marine Fire One rescue boat to the scene at around 5.30pm on Sunday 20 July 2014. The Hoylake and New Brighton Coastguard Rescue Teams were also asked to attend and assist the paramedics and police with the casualties. It was in fact five casualties, aged 14 to 15, that were recovered from the water and checked over by paramedics. Two of the group were taken home by police and the other three were taken to Arrowe Park hospital by ambulance as a precaution. The children we assisted were enjoying the weather and the water with no adult supervision. One young girl was in dire need of help and was rescued by a very brave 15-year-old boy. It is critical to always check the tidal conditions when swimming. The weather on scene was fine, but the hidden danger of the strong currents is something the public should be aware of. If you do get into difficulty, call 999 and ask for the Coastguard.